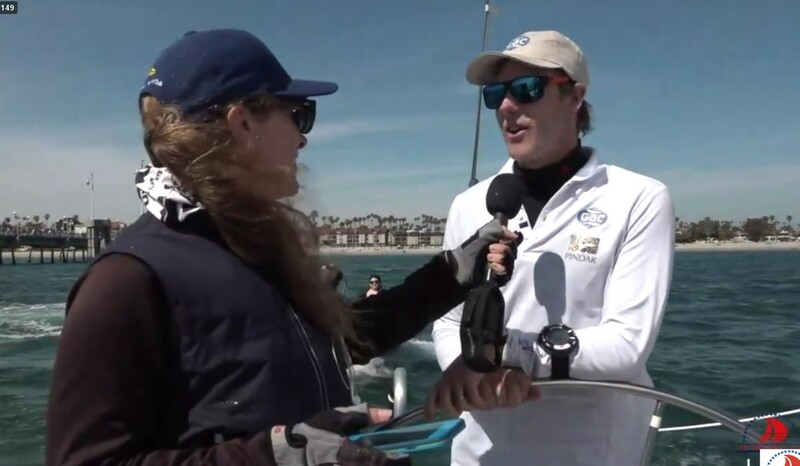 Ian Williams and the GAC Pindar Team took a clean-sweep of the best of five race final to win the 55th Congressional Cup, and a fourth Crimson Blazer. Williams took a three race win over Scott Dickson (USA) on Sunday in the grandfather of modern world-class match racing at the Long Beach Yacht Club. For Williams this was his fourth Congressional Cup victory, winning previously in 2011, 2012 and 2017. Williams was sailing with Richard Sydenham – Tactician, Gerry Mitchell – Main, Tom Powerie – Trim, Jim Turner – Pit, and Matt Cassidy – Bow. Williams is a 3-time nominee for the ISAF Rolex World Sailor of the Year Award, and also a 3-time nominee for the UK’s YJA Yachtsman of the Year award. With the GAC Pindar Team he has a No. 1 World Sailing Ranking. Dickson, a long-time member of LBYC, has competed in 20 Congressional Cups, and is the winningest skipper in Ficker Cup history. Taylor Canfield won a best of three race series against Johnie Berntsson to take third place. Founded by Long Beach Yacht Club in 1965, the Congressional Cup set the standard for top-level match racing worldwide, and pioneered the concept of on-the-water umpiring.